[ADVERT]There is a snug little cafe situated in the back streets between North Sydney Girls, North Sydney Boys and Marist College. Although before school, recess and lunchtime high school students raid the cafe, it is still a cosy spot to grab a bite to eat. There is a large selection on the menu and all the food is appetising, and in nice meal sized portions. I happen to dislike when you go to a fancy restaurant and in all their fanciness only provide a tiny mouthful of food. Here you can get a decent sized meal for a decent price with a great taste. Eat in or take away, you can have it all. They also do catering, but the real treat is to go inside or even sit outside and just relax and eat and chat with friends. See it here as the charming little place it is and how nice it can be on a warm sunny day. Better still, it is only a short walk away from St Leonards Park, if you wish to go for a relaxing stroll afterwards. The service is good, the staff are nice, and very pleasant - they are incredibly friendly people who always wish to make your time more enjoyable. It is a charming cafe and those who live in the area really should frequent it more often. Why? 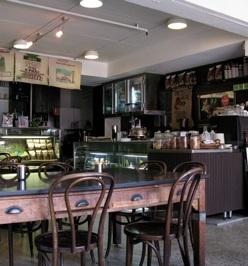 A cosy cafe with delicious food near North Sydney Girls/Boys high school, St Leonards Park and Marist.